NAYPYIDAW — Dozens of people were waiting in Ywar Ma village, part of Naypyidaw’s Dekkhinathiri Township, when the Union Solidarity and Development Party’s campaign float, kitted out with loudspeakers and green banners showcasing President Thein Sein and nearly a dozen USDP candidates, pulled up and parked in the middle of the road. Minutes later, the songs began and a few more people on motorbikes joined the festivities. By the time Monday’s campaign event was in full swing, the road was half-filled with supporters of Myint Hlaing, Burma’s minister of agriculture and irrigation and the ruling USDP candidate for the Lower House constituency of Dekkhinathiri. Many could be seen wearing the T-shirts and umbrellas, printed with script urging support for Myint Hlaing, that put the candidate under the spotlight for alleged electoral malfeasance even before official campaigning for Burma’s general election began on Sept. 8. Myint Hlaing, who has been accused of vote-buying in a complaint filed by the rival National League for Democracy (NLD), did not make an appearance on the campaign trail Monday. According to Thant Zin Tun, the NLD’s Lower House candidate for Dekkhinathiri, township police have said they would begin an investigation into the complaint on Tuesday. One song that blared from the campaign float featured a chorus proclaiming, “We love the father,” though who that father might be within the male-dominated USDP was unclear. “We came to see this from our worksite,” said one farmer on a motorbike who had come from the nearby village of Pyinmana. Hmat Gyi, 65, is a former agricultural manager for Naypyidaw’s Det Khi Na District and a sitting lawmaker of the Upper House, who also holds leadership positions on two parliamentary committees and membership in a third. He told The Irrawaddy he is confident of winning his race, saying that in the course of voter outreach over the last month, “we have reached about 75 percent of the Upper House constituency,” an area that includes 127 village tracts across four townships—Dekkhinathiri, Zabuthiri, Lewe and Pyinmana. The seat, officially known as Mandalay constituency No. 10, has been expanded for this year’s election, and previously encompassed just Lewe and Pyinmana townships. If Hmat Gyi wins, he will continue to work for the development of schools, transportation infrastructure and the economic prospects of his constituents, he told The Irrawaddy. With less than a month until the poll scheduled for Nov. 8, the nation’s two biggest parties—the USDP and the opposition NLD—are taking different approaches to winning over voters in the capital. USDP candidates have received the full backing of the well-resourced party’s Naypyidaw-based headquarters to campaign around the capital; their campaign trucks and floats, typically ferrying singers and candidates, have been entertaining the public since Sunday, and the party plans a veritable campaign blitz across Naypyidaw over the next week. In contrast to the USDP and also to the packed out rallies that NLD chairwoman Aung San Suu Kyi has held in recent weeks, the opposition party’s candidates in Naypyidaw are taking an understated approach. Ma Moon of Thayetkon village in Pyinmana Township said she had twice in two days spotted the USDP campaign truck passing through her village as it crisscrossed the capital. Weeks before, she said, the NLD’s candidates fanned out with far less fanfare, campaigning door to door among residents of the Naypyidaw Union Territory, which all told sees 10 seats up for grabs this year. Union Solidarity and Development Party supporters walk past a campaign poster for the rival National League for Democracy in Naypyidaw’s Dekkhinathiri Township on Monday. Considered a ruling party stronghold, owing largely to its substantial population of civil servants, military personnel and their families, the NLD nonetheless won all four seats in Naypyidaw left open and put to a vote in Burma’s 2012 by-election. Still, some Ywar Ma villagers said they are going with the USDP this November. The ethnic Shan man from Taunggyi migrated to Naypyidaw decades ago and joined the party three years ago. 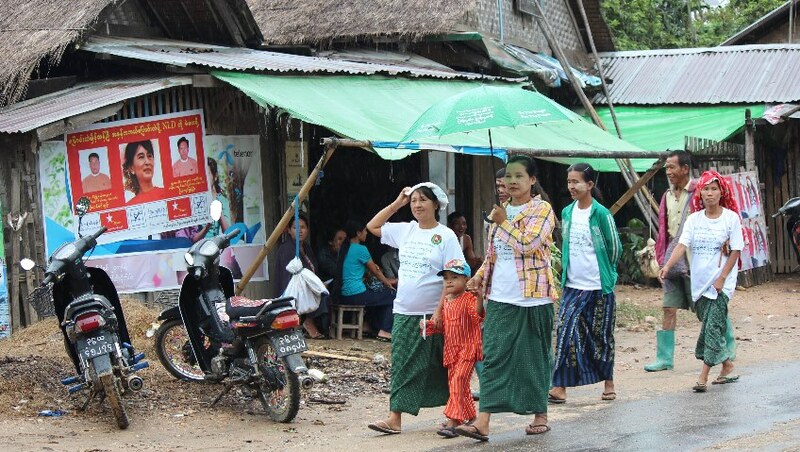 If nothing else, the USDP’s appeal over that of the NLD is clear when it comes to material support: villagers from Ywar Ma, Chai and Thayetkone all noted that if they attended a USDP rally, they would be gifted with food and campaign merchandise including umbrellas and T-shirts, while NLD supporters are expected to pay for these items. But it is also clear that support for the NLD is formidable, even if the party’s backers are more inclined to keep their loyalty private. Even then, support is sometimes unwittingly lent to the ruling party. A plantation worker, who asked to remain anonymous, said she was forced to join the rally when Myint Hlaing gave a speech on Sunday. “Today I did not go when my saya [work supervisor] called us to come [to join the rally],” she said on Monday, recalling how the day prior she had attended the USDP campaign event under false pretenses. “I did not know that we were going for the rally in Hsel Su village in Dekkhinathiri,” she said, adding that the 51 workers at the Set Set Yo plantation were told that they would be paying a visit to one of Naypyidaw’s pagodas. She said she did as instructed by her superior, “who promised to pay our daily wage” of about 3,000 kyats (US$2.30). “We did not have to work but we would be paid,” she explained. Top Photo - (Nyein Nyein / The Irrawaddy ) Supporters of the Union Solidarity and Development Party listen to a speech on the campaign trail in Naypyidaw’s Dekkhinathiri Township on Monday.